The natural gas market view has moved back to “neutral.” With the short term weather forecast a less bearish than it has been, the market mounted a decent short covering rally on Tuesday, pushing prices just above the $3.61/MMBtu resistance level. The market has been oversold and the current rally can only be categorized as a short covering rally and not a major shift in the underlying trend. Depending on the EIA/NOAA winter outlook to be released later today, the market could be pushed off of its “neutral” perch. Later today the EIA will release their Winter Outlook in conjunction with their “Short Term Energy Outlook.” Based on both the IEA and OPEC reports, we can expect the EIA to lower their projection for global oil demand growth. Click here to receive the full versions of all reports. The Energy Information Administration (EIA) has issued its weekly oil inventories report for the week ending Friday, September 30. The EIA’s report is attached. Comparisons of the earlier and less-followed API report, projections for this week’s EIA report, and today’s EIA report are shown below. This report is “bullish” as inventories were materially less robust than projected. Receive a FREE one-month subscription to the full versions of all of Jackson’s up-to-the minute energy news. Early Market Summary: A brief summary of hydrocarbon and risk asset market conditions from the prior day and overnight, with a market outlook for oil, gas, and equities in advance of the NYMEX trading day. Midday Futures and Spot Market Update: Periodic updates during the day on natural gas prices, reason for price movement, and likely NYMEX settlement trend. 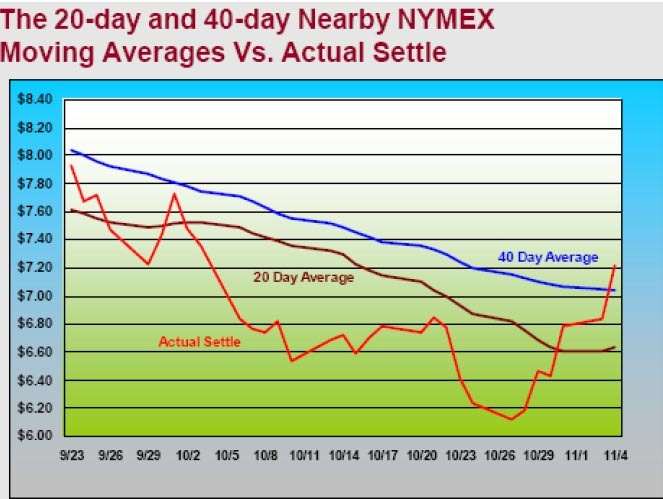 Daily Market Summary: End-of-NYMEX-session report on hydrocarbon market settlement prices, fundamentals and technical influences, and high level oil and natural gas outlook for the coming trading day.